I like that app! what’s the name? I want to download that song!! I want that movie for my kids… What do you mean I can’t get it unless I have an Apple ID ? Yes my dear reader. If you want to interact with the rest of the world and get some music, movies, TV shows, podcasts, apps and books. You need an Apple ID. It’s like a passport or a drivers license. Well… mmm.. sort of. 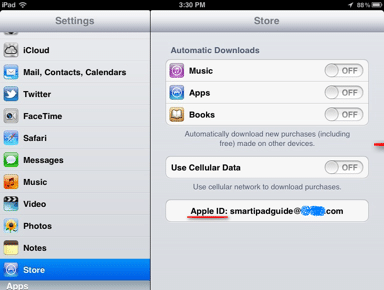 You need this ID to be associated with your iPad so you can access iTunes and the App store and get some content. 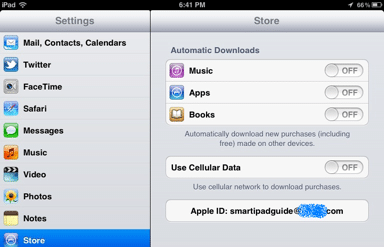 If you got your iPad at an Apple store you probably already have an Apple ID configured on your iPad. Do you know which one it is ? 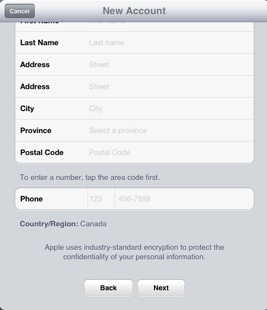 To quickly check if you already have an Apple ID associated with your iPad do the following. 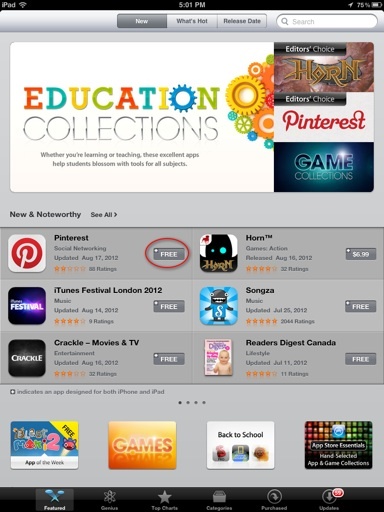 Then tap on Store (lower left). If you see an e-mail address on the “Apple ID” field then you already have an Apple ID associated with your iPad that will allow you to download apps, etc as long as you can enter the proper password. You are set for now. Feel free to browse other posts and don’t forget to sign up to my newsletter to get updates when new posts are released. If you don’t see an email address and the “Apple ID” field keep reading below. There is more than one way to create an Apple ID account. In this case we will see how to create one through the App Store. Before you begin, please make sure your iPad is connected to the Internet. Tap on the featured icon on the bottom left of the screen. Browse the different apps and tap on any that has a “Free” button. In this example, I’m selecting the Pinterest app. The “Free” button switches to “Install App”. Tap on “Install App”. 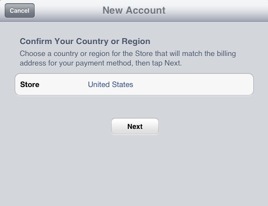 Tap on “Create New Apple ID” and select your country or region. The terms and conditions page appears. Read the terms and conditions and scroll all the way down. If you agree with them, tap on the “Agree” button. A confirmation dialog box appears. Again, if you agree with the terms and conditions, tap on the “Agree” button, otherwise, tap on Cancel. On the next screen, you will have to enter your email address which will become your new Apple ID. 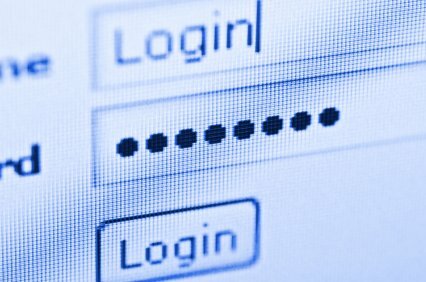 You will also need to enter a password, some security questions (in case you forget your password), a rescue email address (optional), your date of birth and whether you want to subscribe to their newsletters. Take a moment to meditate (Ohmmm… ) and remember the email and password you chose. You will need this information later on. When you are done completing the information required, tap on the “Next” button. 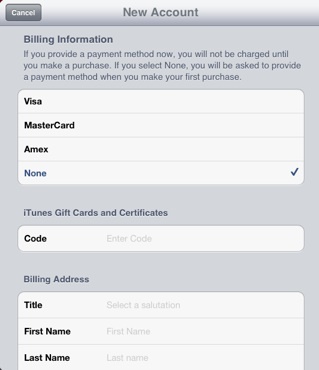 On this step, you can select your payment method (credit card) or “None”. If you choose “None” you will be allowed to download Free apps and will be prompted for payment information in the future whenever you choose to download a paid app. Fill in all the required information and tap on the “Next” button. The “Verify Your Account” screen appears and says that a verification email has been sent to your email account. Tap on Done on the top right corner. 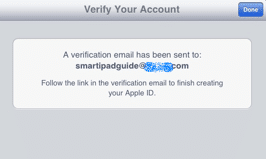 Login to your email account and look for the Apple ID email verification. Follow the instructions on the email to verify the account. Once verified your Apple ID becomes active and is ready to use. That’s it ? Well there is one more little step to get you going. 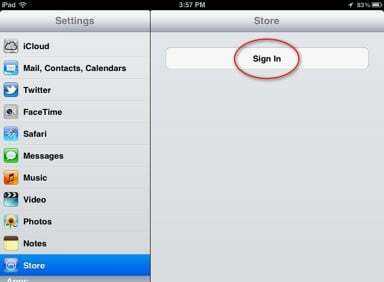 Now that your Apple ID is active, let’s Sign In from the iPad so that you are ready to access iTunes, the App Store, etc. 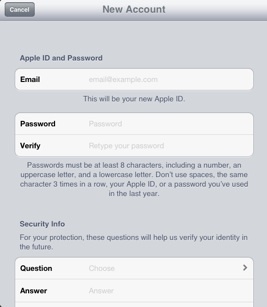 Enter the email address and password you selected before when creating your Apple ID (remember meditation time ?) and tap the “OK” button. If you liked this post, please let me know by commenting on the form below. Sign up to my email newsletter and get notified when I release new posts.